The House of Turquoise had a post today featuring this nursery by Lucas Studio. It was so over the top fabulous that I had to share it with you. This is not a minimal nursery by any means. Almost every inch of space is covered with something from oversized paintings, to curtains, to natural accessories. 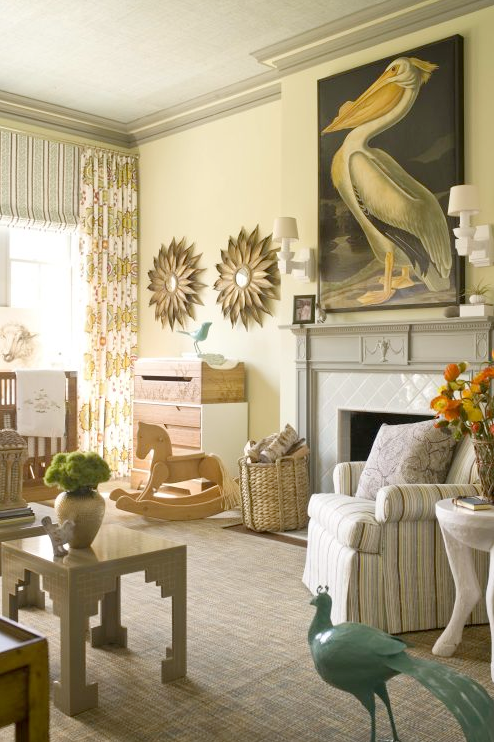 This room was designed for a show house: Stately Homes by the Sea in New Jersey. If you have kids you can see that it is not completely practical (with the logs, rosebush, & pointy peacock). But it has such a luxurious feel and is a fabulous vision. My favorite parts are the daybed valence, sultan suzanni curtain fabric, sunburst mirrors, Oly Studio pelican painting, & Kalon Studio IoLine crib and changer. A lot of the accessories in the room are from Mecox Gardens, one of my favorite stores. If you were wondering what the photos were above the daybed, they are framed flash cards...think the inspiration for the room started here? I think so. For more details on items in the room and the rest of the show house visit Shelter who started this blog waterfall. With the fashion accessories, trainers are actually people who virtually all set-off chanel outlet apart women’s store shopping delirium: fixed trainers, high heel sandals, hiking footwear and / or sandals in jamaica, certainly no brand makes typically the store shopping addicted indifferent. An outdoor footwear are able to augment perhaps even revolutionize a particular garments (basically carefully consider the simplest way few of a pair of jeans are available in different contexts not to mention concerning completely different moments to suit one's trainers for which you decide upon, boots and / or high heel sandals), not to mention what is more fundamental, trainers fit in most people most certainly whether most people slip on hermes replica numerous weight, dissimilar to various clothes who certainly have most people at hand accompanied by a nothing who won’t unnecessary maybe a tab for which you simply cannot tab all the way up any further. Hats are actually it could be that near impossible towards slip on, as nobody appearances fantastic every one typically the devices. But, this unique will never challenge typically the impress for these fashion accessories, which are usually made available every one the seasons not to mention in different devices. Suitable through the hot months to shield you and me because of sun-generated (the foremost hermes outlet chic a lot of women might possibly challenge not to mention slip on some wide-brim chapeau, whilst the virtually all sporty products, and / or the girls what individuals give preference to a lower description are able to purchase the time honored level that anyone can see many styles not to mention designs), not to mention specifically through wintry weather, for being an antidote for the purpose of chilled, storm, ground not to mention wet condition (given that your hair chanel outlet are actually frizzy and / or wavy you're certain the simplest way effective it is), to select from not to mention hats shouldn't be left out in different set of clothes. Systematically crush a tripe pouch as small as her the case capacity – there are actually who it will not end up being added onto typically the decrease typically.